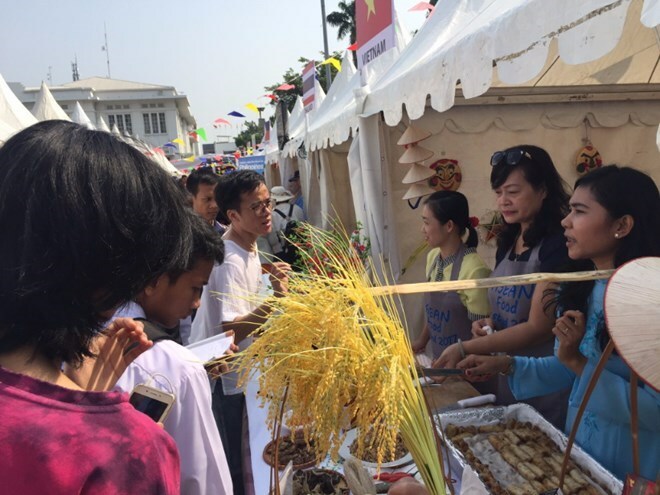 Jakarta (VNA) – The Embassy of Vietnam in Indonesia introduced the country’s signature Nem (spring roll) at the ASEAN cuisine festival in Jakarta, Indonesia, on August 5. The event, jointly organised by the host country’s Ministry of Education and Culture, and the Foreign Ministry’s Department for ASEAN Cooperation, forms part of activities to mark the 50th anniversary of the Association of Southeast Asian Nations (ASEAN). Addressing the opening ceremony, Deputy Director of the Department of Cultural Diplomacy under the Foreign Ministry Nadjamuddin Ramly underlined the significance of cultural cooperation among the ten ASEAN members via efforts and actions to promote solidarity, equality, cooperation and development, with fundamental activities such as the food festival. The ASEAN nations have rich culture and cuisine, he said, adding that promotion of food identity of each nation is a diplomatic channel. At the festival, each ASEAN nation introduced one traditional dish.